Today has not been one of my best, but to add to my gloomy mood is yet another Lake Effect Snow Storm off of Lake Ontario. We have been hit by 4 of these storms since October but I think this one is going to end up being the worst yet. I needed to go out and get groceries pick up a prescription, but it doesn’t look as though that will happen. I am almost out of coffee and used the last of my french vanilla creamer so now I am desperate. I just opened the window long enough to snap a photo…do you think I could make a mad dash for the store before it gets worse??? Looking at towards the road, I’m not sure it is worth the risk…hmmmm…I really want my coffee and creamer. I hope everyone is staying safe and warm…please send me some coffee and creamer…french vanilla please. 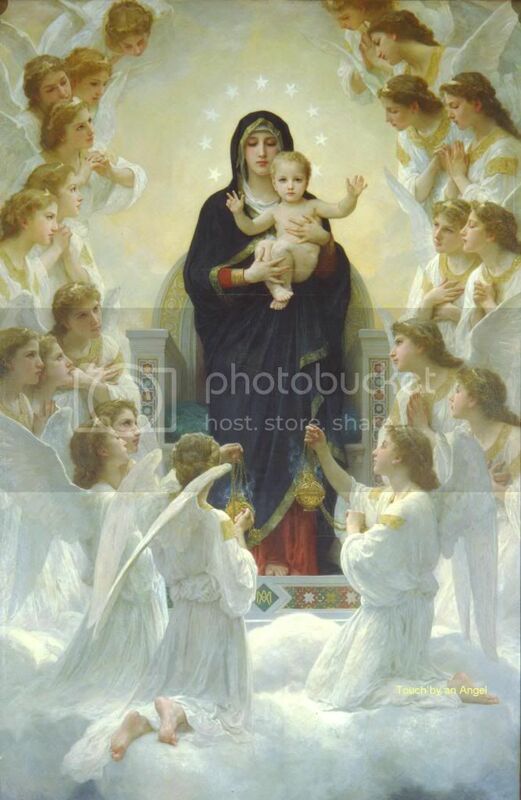 http://i727.photobucket.com/albums/ww276/ANGEL777_01/Bouguereau_The_Virgin_With_Angels3.jpg Angels have no philosophy but love. ~Adeline Cullen Ray This is my last visit to your space for 2008 -may you have a Blessed Christmas,and wonderful – 2009! You\’ve got more snow than we do but our temps have mostly stayed well below 0 for a good while now. \’Jack Frost\’ is most assuredly nipping at our noses in the wind-chill factor! Hope you, dear Emma, and family are staying warm. Bringing by some \’Winter Roast\’ coffee and french vanilla creamer. For some reason I don\’t see the picures. I hope you get your coffee!! Oh no, a storm like that and running short of coffee creamer…that sounds like an absolute nightmare! I hope that somehow a miracle brings along something that will warm you up and satisfy the need for caffeine! BTW, I loved the pictures! Okay here\’s the coffee, be careful it\’s piping hot with french vanilla creamer just the way you like it. (if only that were possible…I would) Hope you\’re doing okay otherwise.The snow looks pretty, but it does not sound like it is so pretty trying to live in and with it. Hope this weather is not doing you too terribly bad. I started drinking my coffee black about a year ago. I heard that by leaving the cream out, I might lose a few pounds. LOL! Not sure about losing the pounds…if they went, they came right back, but the taste for black coffee stayed! Stay warm! Hi Hero, or is it Heroine? ( as you are a girl) Whatever. Well I understand the snow. We are STUCK in Framingham, Ma. it has been snowing since Friday. I think it is up to 2 feet now and colder than COLD!!!! We are probably NOT going to make it home for Christmas but rather be stuck here where we do not know anyone, not 1 single person….yet!To answer the question… Yeah go for it. Oh goodness it looks just awful out there. Stay in and stay safe! Did you go for it? Or did you stay home?? Holy SNOWballs Rhonda! That\’s a lot of snow. I don\’t want to sound rude but I am starting to think that Mother Nature has a message for you. Yup, and that message goes somewhat like this: "Up yours… like it or not, it\’s gonna snowww." But I do have to say that I am jealous. I do wish that we had more snow. Here\’s hoping that the weather will be kinder to you and soon. Cheryll….Are you thinking what Im thinking???!!! Okay Amy…don\’t go starting any more snowball fights…I just spent over an hour shoveling the driveway enough so that I could make a path to get out…I\’m too tired for a snowball fight now…LOL!!! Give me some time to recharge…geez…give a girl a break…Bonnie can you help me out here? Cheryll…yes I sure did go for it and what a wild ride…took me three hours to go to Walmart and get back but decided since I was there I would just do all the grocery shopping…BIG MISTAKE! I came out of Walmart and the snow was blowing so hard right at me that I couldn\’t even see the parking lot…had to keep pushing my alarm on my car for directions and have you ever tried pushing a shopping cart through snow??? God, I thought I was going to have to pick up the stupid thing and carry it…but hey, I\’m stocked up now and happy. And Seth…I agree with you, I\’ve done something to tick off Mother Nature for sure…34 inches of snow is a bit much…I keep telling her I got the message but she isn\’t done with me yet, there is more on the way!!! I\’d send you some coffee and french vanilla creamer but I\’m not a coffee drinker so I don\’t have any in the house. I hope you get a break from the storms long enough to stock up. Fun Suckers! I went through alot yesterday and Im still weak….But do you hear me complaining….NO! Fine whatever, I will give you a day to recouperate. One day. OMG…I\’ve been blessed by Amy with a day to recup…I am most grateful…LOL! Thanks Cheryll…at least I can count on you for a little sympthay and Bonnie loves me too…LOL! You are welcome Rhonda….its a good thing that I like you. ::whispering.. .Dont let Cheryll fool you! :: But….Bonnie….now she is sincere. Excuse me. Can anyone see my back? Is it bleeding? I can\’t tell. I\’m sure it must be. Can someone please look for me??? uuhhhhh…might be blood…not sure…hmmmmm…wanna take a look Amy? LOL LOL LOL, Rhonda. Yeah, AMY. WANNA TAKE A LOOK????? I think if I had a very brazen and sloppily eating stalker, I would know it. I mean, SERIOUSLY. I would probably have caught a glimpse of him somewhere along the way, ESPECIALLY if he gets close enough to leave SPAGHETTI SAUCE on my back. ON THE OTHER HAND, if a certain someone (who shall remain nameless) should happen to sneak up behind me and STAB ME IN THE BACK while I\’m not looking, well . . . . . . I don\’t think I need to say any more. Let me clean that for you….it looks NASTY. ::amy yelling:: "CAN SOMEONE GET ME THE RUBBING ALCOHOL" Ohhh this is gonna get ugly…. Yeah, and while you\’re busy cleaning the wound, could you go ahead and PULL THE KNIFE OUT, AMY??? "COULD SOMEONE GET ME A STICK FOR HER TO BITE ON"
This might sting a little…. Oh my God…can\’t find a stick…will this bone I found work? I\’ll hold your hand Cheryl. If the two of you keep this up, I\’m going to start with the snowballs. Emma says, "did someone say snowballs?" ::amy looking around:: Wasnt me!! No….it was probably just snow falling off a branch. Will someone please catch that frog?